Yes folks, it was love at first site with this one!! 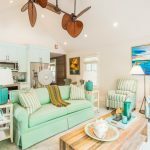 I cannot tell you how much I adore the sea-inspired color scheme with happy bursts of yellow, finished off a with a perfect dose of rustic charm and fabulous appliances! 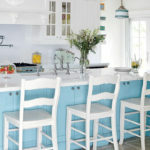 I just love the blue island with the marble top and the great farmhouse sink. The blue display shelves are fantastic too, they really make the vases stand out and provide great contrast to the crisp white cabinets! Dreamy, dreamy, all the way! You can see even more photos of the kitchen over at Better Homes and Gardens! Gorgeous! This is my dream kitchen in my dream beach house! I am in Love with this kitchen! I like all of the subtle hints of color from the appliances to the flowers. Love all of it! Beautiful white cabinetry, beautiful touches of beadboard, beautiful pendants, beautiful marble, LOVE! This is pure kitchen perfection!! I love the yellow accents and the lioght blue accent wall to display the white ware! Beautiful. Your posts are some the most beautiful eye candy. This kitchen with the simple blues and touches of yellow makes me smile. Marvelous kitchen! One would love to spend time in this lovely area of the house with this kind of design! I love the turquoise and yellow together! This is such a beautiful kitchen! This kitchen is a total dream! 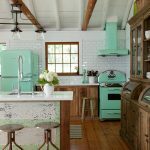 With the frosted glass, white ceramics, white subway tiles and turquoise bead board ….it's totally screaming my name right now! I loved this kitchen when I first saw it at BH&G. Glad you featured it. Especially love the island with it's beadboard cabinetry. Interesting sink too. 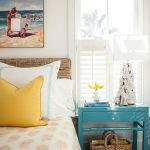 The yellow accents work nicely with the turquoise and white. Lovely light and airy kitchen. Would always make me smile! Yay!! This was the kitchen I did on Sullivan's Island!! So excited to see it here! Loving this kitchen! Using it as inspiration for our kitchen remodel, which I posted about on my blog at http://howsweetlifeis.com/2012/10/16/im-dreaming-of-a-white-kitchen/.